Your best claim is the claim that never happens. What happens when you lack a proactive safety program? Accidents happen, causing your claim costs to spiral out of control, your ex-mod to go up and your premium increases—wreaking havoc on your bottom line. You need to take action—fast! 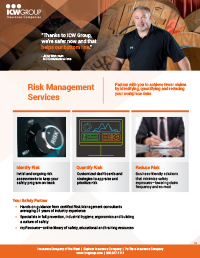 View the Risk Management flyer to learn how ICW Group helps you to create a culture of safety in your workplace. Visit mySafetynews.com, ICW Group’s risk management blog, to find the latest on workplace safety and injury prevention from our industry-leading risk management specialists. Posts include analysis on new OSHA laws, rulings and advice on timely risk management topics. The specialists also address readers’ questions submitted to the blog via the “Ask Us” feature. Visit the workers’ compensation Policyholder Center, Managing Risk area to learn more about our safety programs, safety tools and more. That’s icwgroup.com/pc!